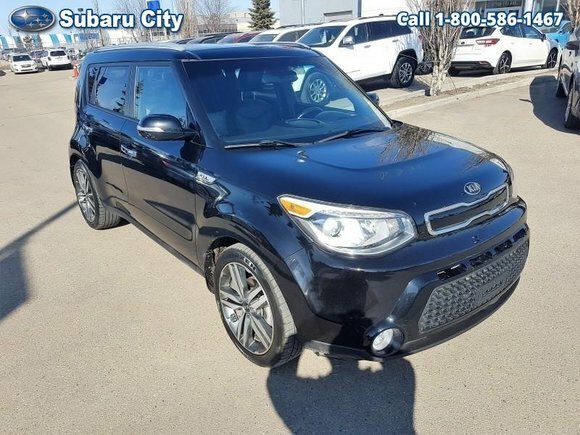 Home > Used Vehicles > 2014 Kia Soul LUXURY,LEATHER,SUNROOF,,AIR,TILT,CRUISE,PW,PL,ALUMINUM WHEELS, EXTRA WINTER WHEELS AND TIRES,CLEAN CARPROOF!!!!! 2014 Kia Soul LUXURY,LEATHER,SUNROOF,,AIR,TILT,CRUISE,PW,PL,ALUMINUM WHEELS, EXTRA WINTER WHEELS AND TIRES,CLEAN CARPROOF!!!!! Cylinders: 2.0L I4 16V GDI DOHC - 4 cyl. Hot Deal! We've marked this unit down $1000 from its regular price of $17900. This 2014 Kia Soul is fresh on our lot in Edmonton. Kia has nailed the daring-but-darling design aesthetic with the 2014 Soul. People love the look of the Soul, and we're guessing you might too. As a bonus that cute exterior houses a surprisingly plush interior for the price and more passenger space than you might imagine.This hatchback has 72899 kms. It's black pearl in colour. It has an automatic transmission and is powered by a 2.0L I4 16V GDI DOHC engine. Buy this vehicle now for the lowest bi-weekly payment of $127.69 with $1858 down for 72 months @ 5.99% APR O.A.C. ( taxes included, $790 Administration and Secure Ride included / Total cost of borrowing $3203 ). See dealer for details. Want to try the 2014 Kia Soul LUXURY?